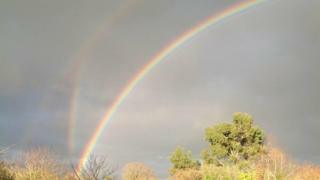 A Gloucestershire village has been treated to the unusual sight of three rainbows. A regular rainbow happens when sunlight is refracted through raindrops, splitting the light into the spectrum of colours. When rays of light are reflected three times within a rain drop, a triple rainbow is produced. BBC Weather Watcher Gordon photographed the triple rainbow in the village of Frampton on Severn. “I’ve never seen such a thing before,” he said. There have only been five scientific reports of triple rainbows in 250 years, says international scientific body the Optical Society. However, it has been suggested that the photograph has not captured a triple rainbow, as they would all form concentric circles, which is not the case in this instance. Your Own Digital Product Empire… in 60 Seconds - ‘Ninja’ Training videos.